McLaren Formula One sad boy Fernando Alonso made a minor tweak to his Twitter profile today that caught the eye of everyone hoping he’ll switch teams and have a more reliable car for 2018. He swapped the top photo from a shot of historic McLarens to a shot of his own karting facility. What does it MEAN? Alonso’s description hasn’t mentioned the McLaren team in a while, so this sort of looks like a normal, non-suspect switcheroo to me. 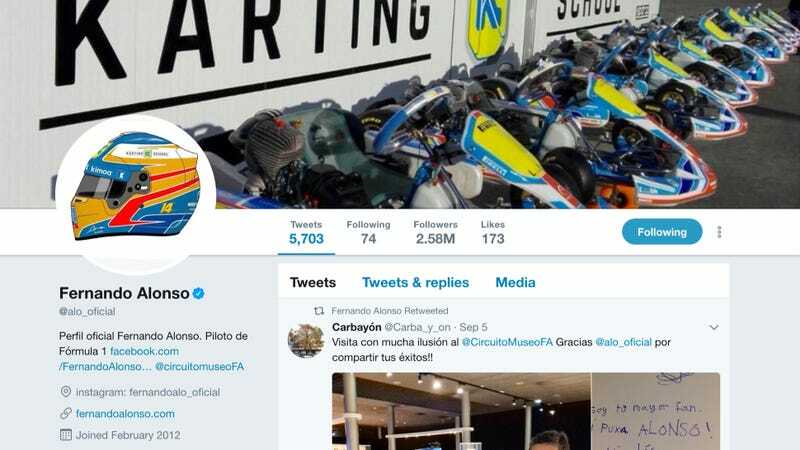 It could just be time for Alonso to promote his own karting school, and the Internet is overreacting as a result. This is how paranoid you’re making us all, Alonso. This! I’m starting to talk to inanimate objects to ask “where will Alonso go, coffee table?” I keep looking out the window for the Alonso Truck to just roll on by in Williams colors. Constantly. Always have to look every two seconds for the Alonso Truck. You mean that isn’t what that van is outside? Hmm. I consulted the one true and correct oracle in my toilet this morning, and the direction the water swirled down the drain seemed to suggest that Alonso was headed to Mercedes somehow. Mighty Oracle of the Porcelain Seas, I am starting to doubt your flowing powers! Just spare us this misery and let us know where on earth you’ll be racing next year, for Pete’s sake.